– you can lick your fingers as you watch. 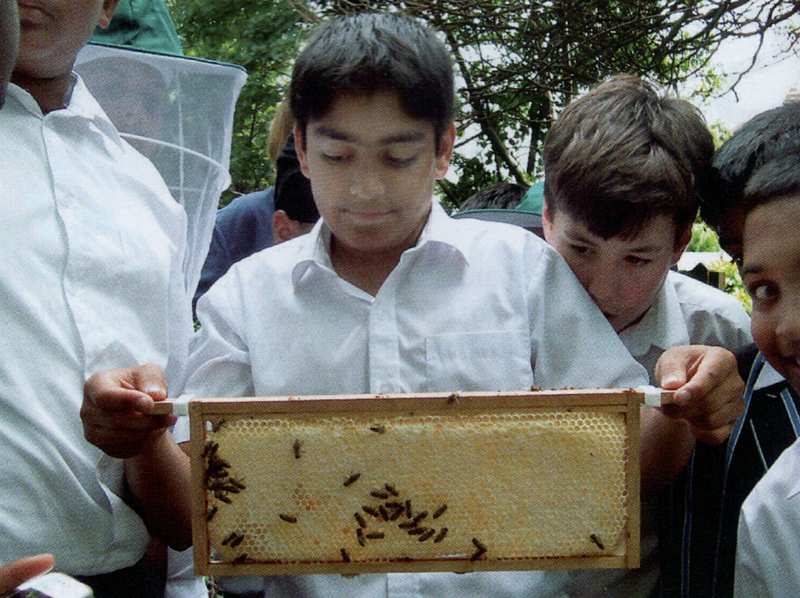 While I was teaching at a local prep school a group of boys visited my home to see my bees and taste the honey. Demonstrating the production of food has become more and more difficult, especially as so much of what we eat is processed industrially and is distributed via supermarkets where good taste is asserted rather than demonstrated. With the demise of rural science as an exam subject, and few schools where gardens can be tended or animals kept, opportunities to demonstrate a short food chain must surely be welcome. Anything that enables children to taste fresh food, and to understand how good food can be produced will make them a little more self-reliant and more able to question the strident claims of advertisers. I keep bees and last term thirty eleven year-olds from the boys school where I was teaching visited my home one afternoon to see and taste for themselves. Preparation by a science teacher colleague was thorough. I provided samples of comb, bee cells, dead specimens of workers, drones and even a queen as well as an empty hive which the pupils dismantled and reassembled a number of times so that they understood the physical environment in which honey bee physiology is played out. In the lab they learnt about this physiology and were ready then to formulate their own questions, before and during the visit. Initial precautions were very straightforward; parents were asked in giving their consent to the visit whether there were any known allergies to insect stings and a pain-killing spray and an anti-histamine cream were made available. The need to approach the hives carefully to assess the mood of the bees was stressed. [Just, I explained, as you approach someone you don’t know very well.] Watch from a distance, five to ten yards sufficed in this case. At this distance you can see what the beekeeper is doing and you can easily hear his running commentary. If one or two bees come and hover in front of you they are just being nosey, but, if this makes you uncomfortable, just walk away, in this case through a gate in a tall fence and back onto the garden. Approaching hives, slow approach, prepared to withdraw. If you are still uncomfortable, step out of direct sunlight, in this case into the garden shed. As it happened, the one boy who had voiced his noisy fear of “killer” bees, but was so desperate to see what was going on, suddenly realised that he was trapped closer to the bees than anyone else by the group of fifteen boys through which he had just pushed his way. We had stopped the boys simply to watch the bees coming and going from the four hives. At this stage the boys became very quiet. In fact, the bees were too busy to take any notice of them as they stood quietly to one side, away from the flight lines in front of the hives. Then gradually, the boys got closer as I put on my veil and gloves and prepared the first hive for inspection. Eventually I had to persuade them to stop about ten feet from the first hive which I was to open up, not because they were in any danger, but because I needed the space to work. Two boys volunteered at this stage to put on veils and help me move various items around a little closer to the hives and from each of the two groups I selected the most nervous of the boys to take photographs, a trick that seldom fails. What did we find? A lot. Workers, drones and a queen, marked, with her wings clipped to discourage swarming. Eggs, just visible to the naked eye, larvae, sealed brood, and seeing the differences between the different cells and learning the reasons for being able to distinguish them. On one frame of comb there were five worker bees biting their way around the wax caps of the cells in which they had been incubated. Above the queen excluder, which they now understood, there was sealed honey and unsealed cells where bees were processing nectar by swallowing and regurgitating it to reduce its water content. Finally, we found a comb of sealed honey which we passed around so that the boys could feel the weight of it. By this time the presence of a few bees on the comb failed to discourage them and they realised that you do not have to be frightened of this brand of creepy-crawly. The remaining bees were persuaded to depart – by blowing on them, and the first finger tip was inserted. Real honey, straight from the hive, actually from the bees. The looks on their faces said it all, the moment they could see, hear, smell, feel, taste and understand. Then they returned to the garden, to drinks and homemade cakes and their questionnaires, and their companions who had been learning to play French cricket took their place. Although I was one of the teachers, I could not function as a supervisor while I was handling bees. As an instructor, I kept up a running commentary but my colleague had to be prepared to direct and manage the boys, at times under my guidance when I anticipated what the boys might do or want to do. A bee handler cannot approach spectators in a hurry, especially should the bees take exception to being disturbed. The bees will mill about the bee handler and will follow him and then interest themselves in the spectators as well. So, enlist the help of parents and prepare children well beforehand so they arrive for the visit feeling that they already know something about bees and honey.